Stay on this road passing Hillington, West and East Rudham and Dunton. Half a mile on you will reach the village of Sculthorpe and take the first left and then left again on to Moor Lane. Go through the village on to the T junction and turn left and then immediately left again onto the Church drive. The Barns are situated on the continuation of the Church drive and signposted. From the A11 take the A1065 to Brandon, on to Mundford and Swaffham to Fakenham. At the roundabout, take the A148 for 1/4 of a mile turning right onto the B1355 to Burnham Market passing the Golfing Range. Proceed for approximately 1 mile to a cross roads and turn left. Carry on for 200 yards and take the Church drive to your right. 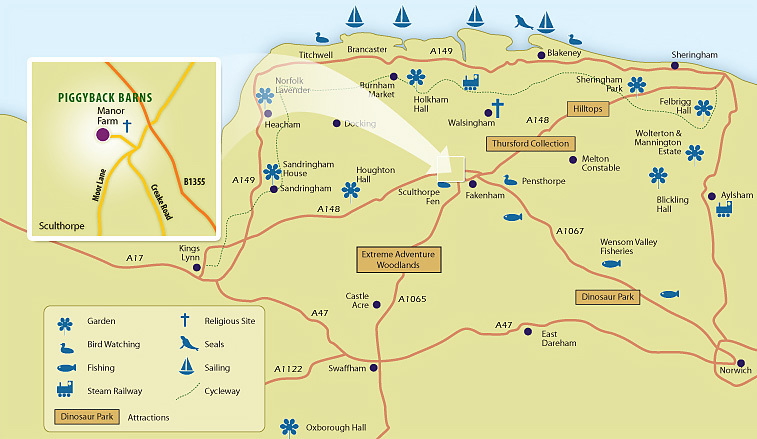 The Barns are situated on the continuation of the Church drive and are signposted.